Preparing for a positive outcome in the wildlife pond, that some tadpoles escape being eaten by Damselfly nymphs and make it to froglet stage, tonight’s gardening job was extra plant cover for their emergence from the water. 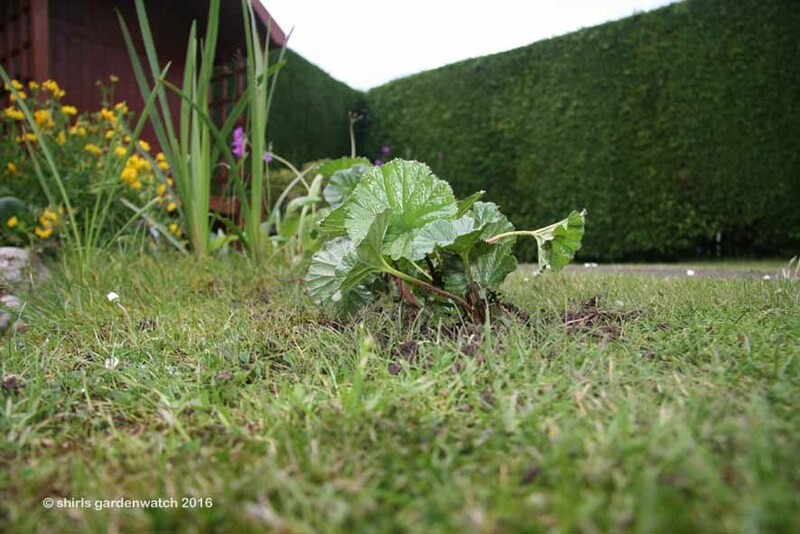 A Gunnera plant (commonly known as giant rhubarb) wouldn’t be the first plant to spring to mind for this purpose. However, I didn’t just plant one Gunnera on the edge of my small wildlife pond tonight – I planted two! The giant Gunnera manicata can grow to 2.5m (8ft) tall by 4m (13ft) wide or more, although the one I’ve had, for a number of years now, has been very well behaved behind my front fence. Pond side, it was two miniature Gunneras I planted tonight. Gunnera magellanica will make a great edge of creeping ground cover. Its round, almost glossy leaves are a dainty 2cm (1”) and it only makes a height of 15cm (6”) – a perfect froglet height! As a gardener, I’m looking forward to seeing this new gunnera in flower but am aware that a creeping habit might mean it needs kept in check. It's hardiness in my garden may be in question too so I'll consider giving it winter protection. It's always interesting to see how an unfamiliar plant behaves, isn't it? 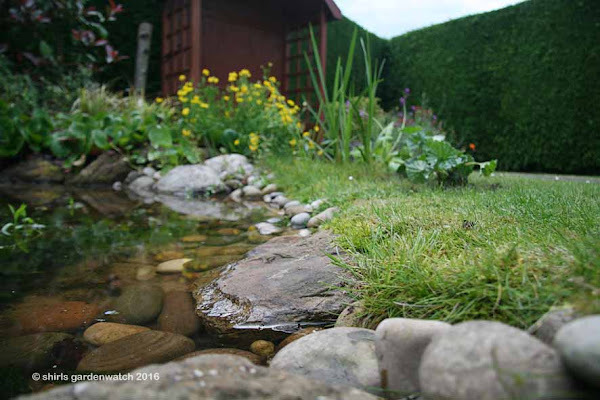 The sloping stone will make it easy for the froglets to get out of the water. If the froglets go in the other direction they will find a terracotta house waiting. 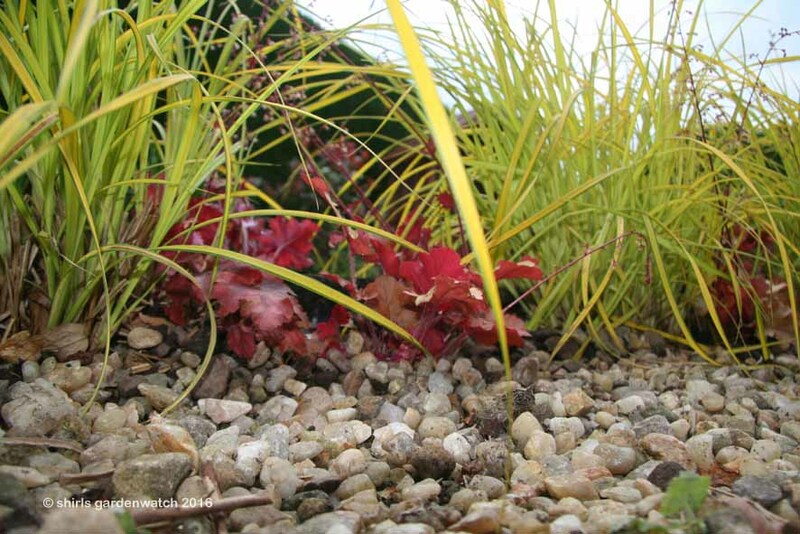 Plantings of bergenia, grasses and heuchera will provide more cover too. will need to cross to get to the nearby border of well established plant cover. Most often I find our froglets hiding in long grass. I think they like that as it retains moisture and gives shelter on hot days. My garden isn't as tidy or well kept as yours Shirley so they have plenty of places to choose from! Frogs haven't found their way to our newish pond yet, unfortunately, but we do have a big toad that puts in an appearance every now and then. You have made excellent provision for the froglets to get out so everything should be just fine. I love this frogs eye view of your garden. We once had a giant gunners that was kept restricted by being planted in a sort of brickwork container that once housed our pond filter. The thorns on it were deadly too. 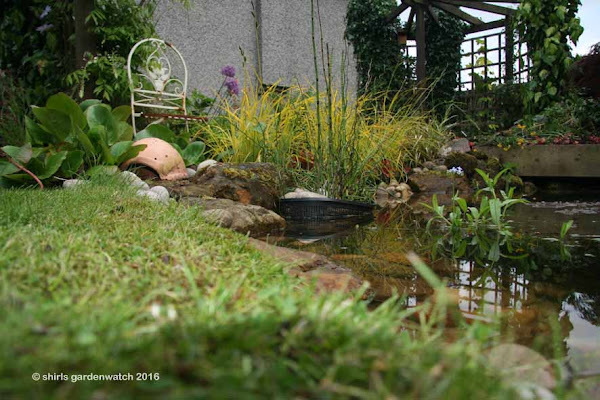 The gunnera is long gone and the container houses another pond filter now. it's amazing how far froglets travel for cover and where they will hide.